I believe I wrote a post about menu making sometime last year…I need to check to see. But a conversation with my mother the other day had me thinking that maybe I should go into more detail about the importance of menu planning. My family is one of three (four if you include my Sasha Fierce puppy) and you would think that it would be easy to make sure that dinner is efficient and healthy. I’ve found that is not a correct assumption if you take into account that there are days when after school activities, homework and anything that pops up can make for a long evening (or take out/eating out) if planning isn’t done. 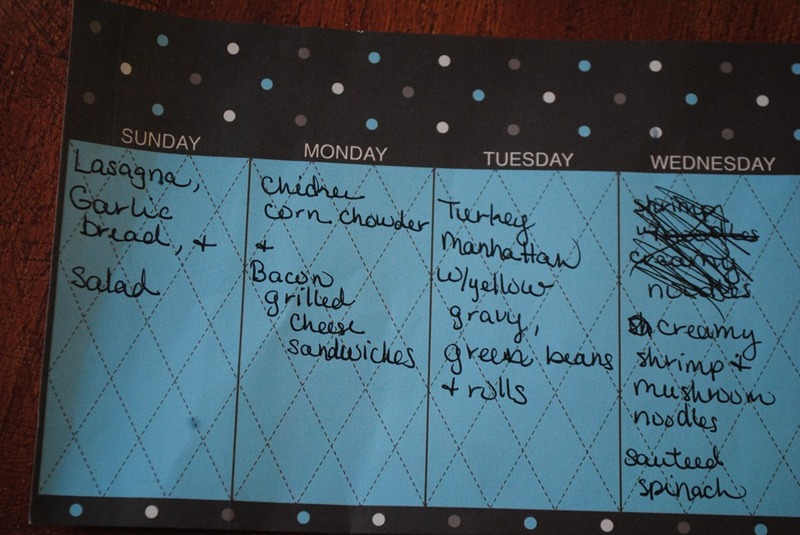 My mother was saying that she used to do a weekly menu when we were younger…we were a household of 6 (four children and 2 adults) and she was a stay-at-home mom off and on so a budget was important to her. Since it is just the two of them, she didn’t feel that a menu was something that she needed to do anymore. She just had a change of heart and we discussed our reasons for weekly menus. 1) A menu informs family members what to expect for dinner. How often have you heard, “what’s for dinner?” How often have you gotten home and scrambled to get dinner together because you forgot to pull something out of the freezer? 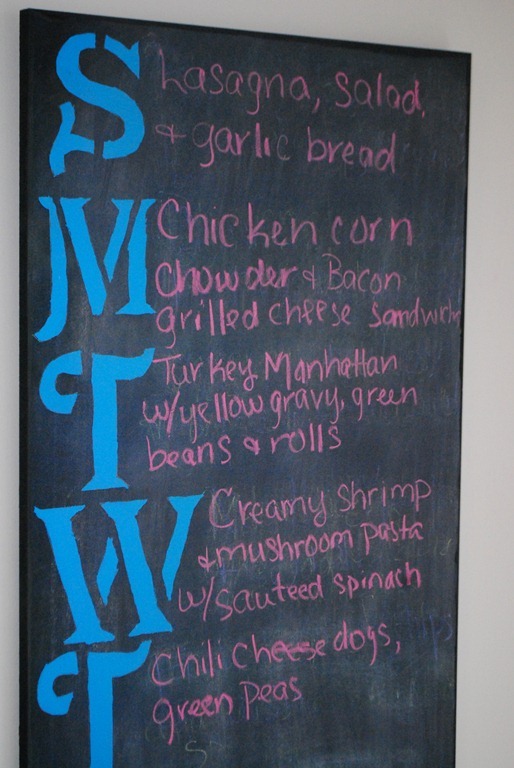 I have a menu board hanging in my kitchen that has the menu for the week on it. When someone (usually Stan) asks “what’s for dinner?”, I just point in the direction of the board and say “what does it say?” Before I head out of the house for work, I look at the board to make sure I don’t have to pull anything out of the freezer; I also look the night before to make sure nothing need to come out the night before so that it can go in the crockpot. 2) A menu is the best thing to use when making a grocery list. My grocery bill is about the same every week. I’m not too happy with the amount I spend…but this is more reflective of the fresh fruit, the request for “must have” items, and meat that I buy and not because I’m not being thrifty. Now if I didn’t have a menu that I made the grocery list from along with me, I think I would spend much more. Making a menu for the week allows me to go through my freezer and pantry ahead of time and make the most of my grocery budget. My mother came to this same conclusion. Also, using a menu with my grocery list keeps me from having to make mini stops to the grocery store during the week that always end up with me purchasing something other than what I came in the store for. 3) Do you ever get tired of eating the same thing all the time? I do. Since I love to cook and am trying to raise a child that has a diverse palette; being able to mix up what is cooked is important to me. Having a menu allows me to do this. Oh sure, there are standard items that show up often enough (my baby doll loves her some chicken and waffles or brinner –breakfast for dinner), but having a menu helps me to space out the frequency of said items. There are some things that never change on my menu – Monday is soup & sandwiches, Thursdays is something really quick and easy due to a late night with ballet – but what I serve I try not to repeat them only once a month. Also having things posted on the menu board makes it easier to introduce new things. When the baby doll sees quinoa on the board and ask what it is, I can explain it and she has time to process it in her head and will be open to trying it. If I just put it on her plate I may get the frunched up face and “it looks disgusting”; I then spend most of dinner trying to get her to try it. 4) Nutrition anyone. My baby doll needs to have a diet that includes foods that make for healthy digestion. Making a menu lets me look at my dinner choices – sides and grains – and add things if I notice an imbalance. Also, I have recently begun watching my caloric intake (I’m not dieting, just being aware of what I eat) and menu planning helps me become more aware of what’s a good calorie food and what’s a bad one (of course, the homemade pound cake is good no matter how many calories it has. ). So there’s the reasons why I feel making a menu each week each week. I’d love to hear your opinions on menus and if you use them.